A negative ion generator is a device that emits a stream of negative ions into the air. The result is a cleaner fresher air due to the electrostatic settling of dust and the supposedly invigorating effect of breathing negative ions which are apparently found in abundance in the vicinity of waterfalls and mountain tops. In addition an ioniser can reduce airborne odours due to trace quantities of ozone produced at the tip of the ionisation needles. The principle of ion generation is fiendishly simple. The electrical charge on an object is greatest at the sharpest point (that's why electrostatic generators favour big curvy domes for charge retention), so if a high negative voltage is applied to a sharp needle then the charge at the tip is so high that ions are literally thrown off and then repelled by the negative field on the needle. This results in a physical draught and a slight hissing noise. 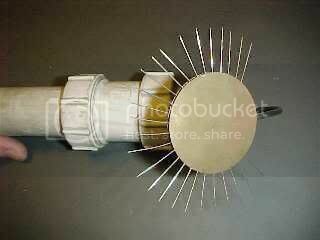 In a very dark room you will also see a faint purple corona glow on the needle tips. Most technical wisdom suggests that while negative ions make you feel good, positive ions can cause headaches and nausea. This is why a negative ion generator can improve the perceived atmosphere in an office that has an unaturally high positive ion balance. But enough of the quackery... Here's the data. This is the basic circuit of most ionisers. It's basically a long Walton Cockroft style voltage multiplier running directly from the 220/240V mains supply, which has it's high voltage output applied to the emitter needles via a couple of high voltage high value resistors (usually 10 Megohm). The resistors are there for safety to limit the current if someone touches the needles. The multiplier usually consists of 22 to 30 capacitors and diodes (the sketch above has been simplified) and the capacitors are rated for about 630V DC, although most mains suppression capacitors rated for 275V AC seem to work just fine. 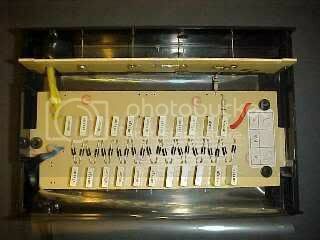 The diodes are generally IN4007's which are standard 1A diodes rated at 1000V. In most cheap commercial ionisers the capacitors are rated at 10nF (0.01uF) but in my own designs I tend to use 100n and 220n capacitors for a much greater output. The optional output indicator is a simple circuit that uses a capacitor, resistor and neon indicator lamp to monitor the amount of current flowing to the emitter needles. It relies on the fact that the potential difference across the circuit charges the capacitor until the strike threshold of the neon lamp is achieved. The resistor limits the current through the neon lamp which then discharges the capacitor until the voltage is too low to keep the lamp lit. The speed at which the lamp flashes is thus directly proportional to the current flow. The power consumption of an ioniser like this is so low that it can be virtually considered as being zero. Remember that capacitors store charge and in this case it is at a high voltage. The circuit will hold a charge after being disconnected from the mains supply and can give you a nip. If you are going to work on it then it's a good idea to remove most of the residual charge by shorting the emitter needles to the other end of the ioniser with a bit of wire. 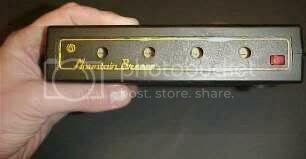 This is my first ioniser, it's an older model Mountain Breeze ioniser made in Britain. It claims to precipitate dust out of the air over a 20' (6 metre) square area and warns that the unit is sealed and requires specialist tools for servicing. It was sealed too, but one quick crack with a screwdriver and it popped open nicely. It uses the standard layout of 10n caps, IN4007 diodes and two 10M resistors connected to a cluster of needles. Most ionisers of this type tend to use only about 22 capacitors since they seem to regard this as the minimum they can get away with. This is possibly to keep the ozone emissions from the needle corona low, but is more likely to keep the cost of manufacture down! Here's a close-up of the safety resistors between the voltage multiplier and the output needles. Modern versions of the same brand and many other brands have ditched the circuit board completely, and just hard-wire the components together like this. This approach to manufacture makes the circuitry much cheaper and has significant advantages of isolation between high voltage parts. 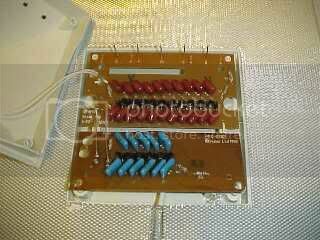 This is the mains end of a multiplier that I hard wired together using 30 220n capacitors. If you attempt to assemble your own multiplier in this manner, then be careful to tin all the connections with solder before assembling them since soldering four loose connections together can be quite awkward, even when the capacitors have been stuck together rigidly. As a timely reminder, the diodes should all point with their marker band towards the mains end of the multiplier to ensure that the high voltage end is at a negative potential. This particular voltage multiplier was slid into the casing of a dead fluorescent light batton for use as a compact source of HT for an ozone generator. 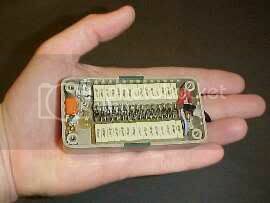 This on the other hand is a PCB based voltage multiplier built with 30 100n capacitors some time ago. 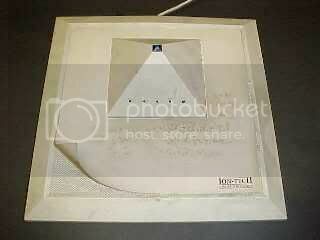 It was fitted into a piece of drainage piping and used as a powerful ioniser. Commercial ionisers have to shield their emitter needles for safety and this can affect their output by restricting the airflow in the vicinity. But this home built ioniser doesn't suffer from this restriction! You can get quite artistic and creative with your emitter designs. This rather interesting variant on a normal ioniser has two voltage multipliers. The red one generates the high negative ionisation voltage, while the blue one generates a much lower positive voltage which is applied to a metal mesh on the base. A kit ioniser from many moons ago. This neat design packs a lot of ioniser into a very small space, but compromises on electrical separation in doing so.